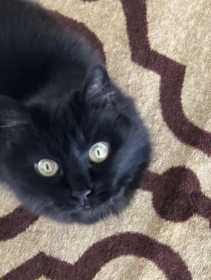 We lost our black cat some time between last night and this morning. She is a 15 year old indoor cat who is friendly but not used to being outside, so probably skittish. She escaped from our house on Topaz Way in Diamond Heights. She weighs about 11 pounds and has a bushy tail and green eyes. Answers to Dot. Please message if you see her. She may be hiding in an entrance way or under a car.